Try this unconventional homemade vegetarian and vegan butter bean soup recipe. Butter beans, or lima beans, add such a great texture to a soup, being larger and softer than most beans, giving your butter bean soup a texture which is different than most other bean soups. This simple low-fat vegetarian and vegan butter bean soup recipe is made with tomatoes and lots of veggies, including carrots, celery, onions, and tomatoes, for a nutritious and soothing meal. Plus, it's incredibly simple to prepare. If you can chop veggies and work a can opener, you can get this soup on the table in just about thirty minutes. Add a side green salad, and dinner is served! All of the ingredients are both vegetarian and vegan. If you need it to be gluten-free as well, just swap out the regular flour for something gluten-free, or, use a tablespoon of cornstarch mixed in water to thicken your soup as needed. If you're not eating vegan, you might want to top this soup off with a touch of fresh grated Parmesan cheese, or, for a little extra flavor, add in some nutritional yeast if you are eating vegan. 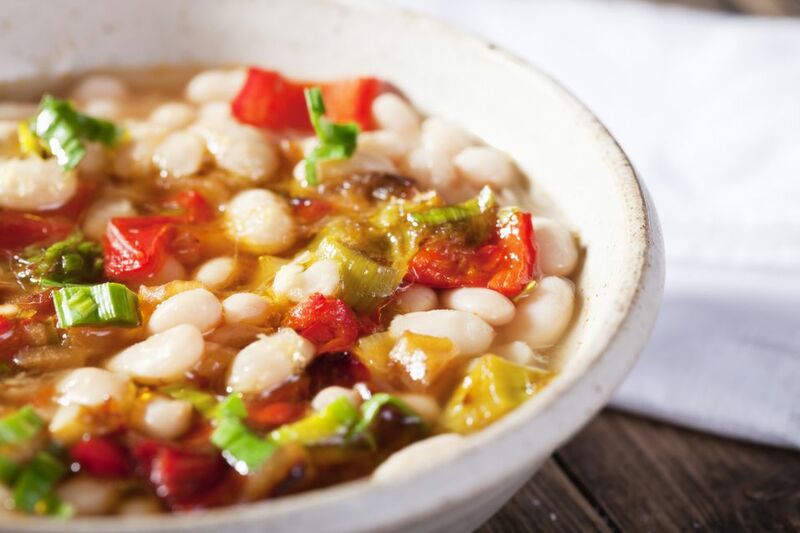 This vegetarian butter bean soup recipe is courtesy of Bush's Beans. Like making homemade vegetable soup? You might also want to try one of these seven ways to make vegetable soup or, try one of these 10 creative vegetarian and vegan bean soup recipes. In a large soup or stock pot, cook the celery, carrots and onion in olive oil or vegetable oil over medium high heat until soft, about 6 to 8 minutes. Next, add the flour and whisk it well to coat the vegetables for one minute. Gradually add the water, stirring and continuing to whisk together until smooth. Next, drain and rinse the canned butter beans. Add the butter beans to the pot, then add in the diced tomatoes, basil and salt and pepper, and bring the mixture to a boil, giving it a good stir. Reduce the heat to medium low, cover, and allow the soup to simmer for about 20 to 25 minutes or until slightly thickened, stirring occasionally. Taste, and adjust the seasonings to taste, adding a bit more salt and pepper as desired. Out of basil? Just about any Italian seasoning will do in place of the basil. Swap it out for an Italian herb blend, some parsley, or even rosemary. Like this butter bean soup recipe? Scroll down for more vegetarian bean soup recipes to try.